advantage is within a given space double row will take maximum radial load. Generally they have one double cup (outer race) and two cones (inner race). To achieve the required radial and axial clearance a spacer is provided in the factory, selectively for each bearing before final assembly. By this arrangement assembly in the user shop floor is made much easier. Nut can be fully tightened and locked. No fine adjustment, taking back by 1/6 turn or torque loading are necessary. c) Type of load (i.e.) frequency, direction, impact etc. 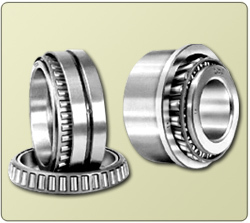 The Bearing and chock assembly can be removed from the next as a unit without loss or condemnation of lubricant. The chock assembly can be re-installed on another roll neck in a minimum of time. The space limitations on medium duty installations have made it necessary to provide narrow double row Taper Roller Bearings, thereby the bearings become cheaper in cost. 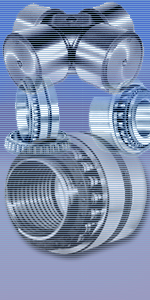 Applications where high load capacity in a minimum of width required, double row Taper Roller Bearings have been popular. In high speed applications like rolling mills subject to medium separating forces, double row Taper Roller Bearings with taper bore can be used. Assembly of two row Taper Roller Bearing is very easy. No pre-loading is necessary. It is a simplified design eliminating cumbersome construction and extra thrust devices.